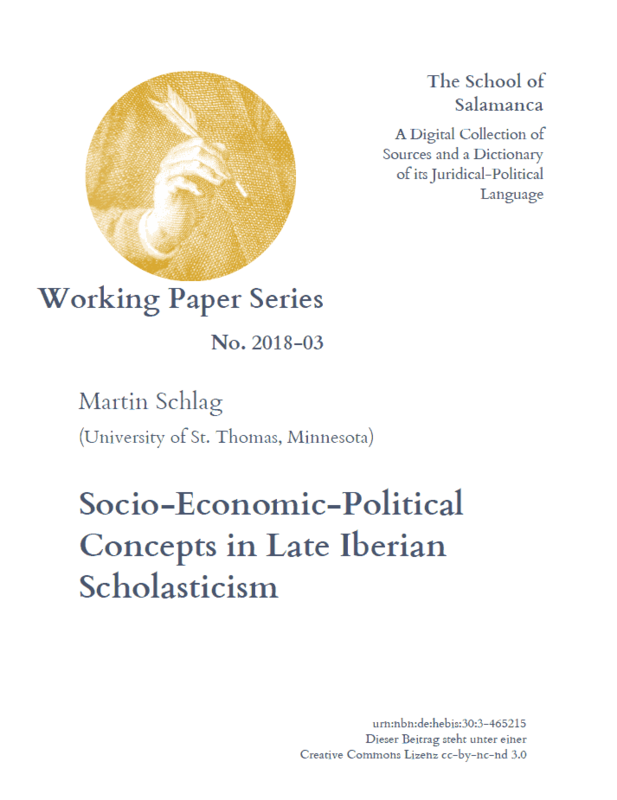 Martin Schlag: Socio-Economic-Political Concepts in Late Iberian Scholasticism, SvSal WP No. 2018-03. The School of Salamanca, and Iberian late Scholasticism in general, had the merit of transposing the wisdom of medieval scholasticism into the coordinates of early modernity. Due to the economic growth after the discovery of America, economic terms and moral problems become a central focus for moral theologians. In this article, I consider important key economic concepts that deliver a surprising wealth of insights into the modernization brought about by the leading scholars of the time. Social mobility, the principle of majority decision, the inviolability of property, human rights of the person, limited political power of the pope, and other key concepts that were decisive for the development of democracy and modernity are to be found in the works of the School of Salamanca in connection with economic issues.